Reading books with your child starting at an early age is by far one of the most incredible gifts you can give. Why? Not only do books promote pre-literacy skills but they are also one of the BEST speech and language activities you can do with your child! How is this? Books are filled with both LANGUAGE and VISUALS and they address TONS of social skills as well. When you read a book with your child, you are working on: language comprehension, joint attention, eye gaze for social referencing, securing attention, social commenting, conversation and more! 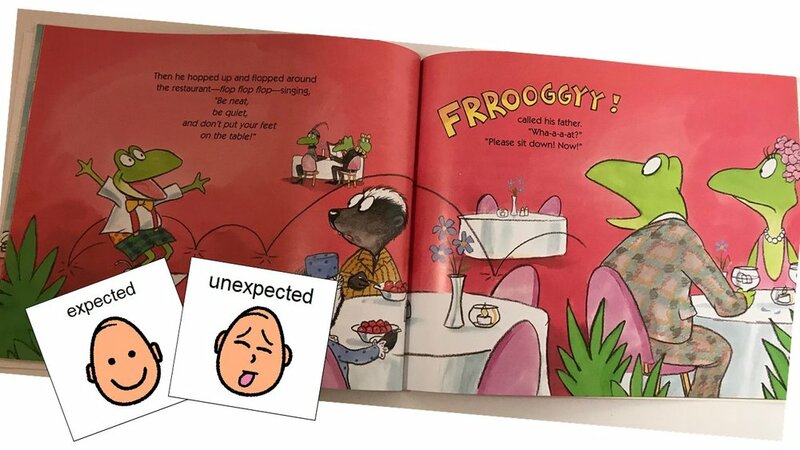 The fact that children’s books have illustrations helps up capitalize on providing visual supports paired with verbal language…..which is not only extremely beneficial for children with autism spectrum disorders/language disorders/learning difficulties, but for all children. Nice clear and simple illustrations, nothing too busy or abstract. Not too many pictures on one page. Stay away from too many books that have buttons and make noise. These can be great for your child’s break time but sometimes the sounds can be distracting and can divert their attention from you; therefore, the social interaction is limited or even nonexistent. Stay away from too many “first word” books or picture labeling books. Again, these can serve a purpose for your child’s development but books with a story or books that address some sort of theme or concept tend to be more linguistically rich and provide many more social opportunities when reading with your child. Don’t worry if the language within a book is too complex for your child. If you like the illustrations and theme, you don’t have to read the book word for word. Simplify the language by describing the illustrations. If attending to books is hard for your child, start out slow. Hold the book to where the illustrations are within your child’s visual field. Try making up a song using simple language to go along with the illustrations. Point to the pictures while you sing. It’s okay if your child wants to walk around the room while you read or sing, they are still listening! Keep practicing and as your child becomes more familiar with the routine, they are likely to start coming closer and closer to you and the book…..becoming more involved in the social interaction. Once your child starts attending more and eye gazing more, then rotate in a new book while still keeping the familiar book a part of your child’s routine. Once your child starts attending even more, read the words to your child instead of singing and maybe even help them point to the pictures with you. Nice clear illustrations that focus on characters actions/thoughts/feelings – we love it when the characters are talking or in action so you can talk about all of our social learning concepts. Give your child a variety of different books by different authors and illustrators. We have had quite a few children come to KidSpeak and they are only interested in one particular book. It is important to expose our children to many different books that touch on different language and social skills. Don’t worry if the language within a book is too complex for your child.If you like the illustrations and theme, you don’t have to read the book word for word.Simplify the language by describing the illustrations and build up to reading the book the way it is written. We then incorporate all of our Social Thinking© concepts, comprehension activities and more while we read. Here are just a few of KidSpeak’s favorite children’s authors! Donald Crews: colorful and simple illustrations with transportation themes and more. Deborah Diesen: has created a wonderful series with the Pout Pout Fish that has bright and colorful illustrations that focus on feelings, holidays and more. Rachel Bright: has an adorable series with her Love Monster! All of her books do such a great job of talking about feelings, problem solving and more. Have fun reading books with your child as you build your relationship with them and teach them language and socialization at the same time!